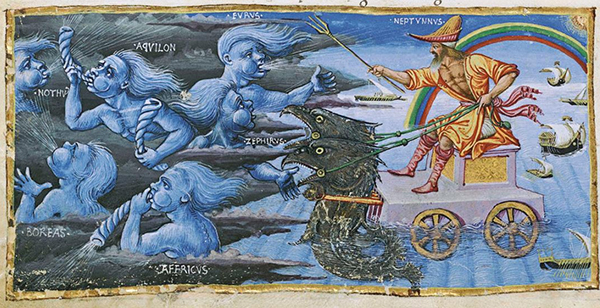 Found in a 15th/16th century manuscript, miniatures from Virgil's Aeneid. The best of a series of 4 featuring the Anemoi. Before the cardinal compass points were a thing, the 'Winds' would be marked on maps. Bigger maps would feature a network of connecting winds, like a web. These are awesome! 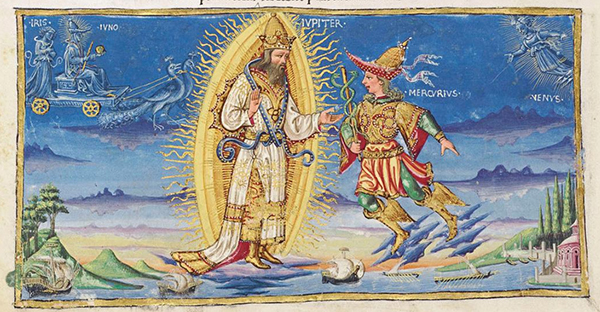 I especially like the depiction of Mercury in that first image. Interesting backstory about the winds, never knew that. some keywords on that would be "windrose", "compass rose", "rhumb lines/rhumbline network". At other times, the "cardinal directions" would be landmarks or other locations.. like "to jerusalem" or.. "towards the mountain", etc.